Gardening is a waiting game and it can take months, even years, to see the best results. However, when growing vegetables, some crops will be ready to eat only a month after sowing – and what a great motivator to grow more! Sowing seeds is relatively straightforward. Just scatter them thinly on a layer of soil and cover with a little more. You’ll usually find everything you need to know about spacing and depth of planting on the seed packet. If you’re a little impatient, you can always buy a young plant instead of seeds. Australia and New Zealand are home to several climate zones so it is best to ask your local garden centre for advice on when to sow the seeds of each variety of vegetable you’d like to grow. Seeds tend to come in large quantities and you often end up with excess seedlings, so why not find a gardening buddy you can swap and share with. Sprinkle a pinch of seeds thinly into a pot of soil, cover with a fine layer of potting mix and water lightly. Keep the soil moist and make sure your pot gets plenty of sun. When your seedlings appear, thin out the plants so that they are 2.5cm apart. Your lettuce is ready to harvest within four to six weeks of sowing. For nonhearting lettuce, pick the outside leaves frequently to encourage further growth. Hearting lettuce is harvested whole and is sweeter when picked young. Peas are easy to grow but prefer cooler climates. Use a large pot with good drainage and fill with soil leaving a 3cm space at the top. Create or buy a trellis for the pea plant to climb on. Plant your seeds 5cm apart and 2.5cm deep and water thoroughly, don’t water again for a couple of days. Keep in a lightly shaded area for 10 – 12 days then move your pot into full sun. Keep your soil moist and leaves dry. Harvest pods regularly to encourage growth. Use a pot or growbag that has good drainage and is at least 40cm deep. Place 15cm of mixed compost and potting mix in the bottom and place seeds 30cm apart on top. Cover with about 15cm of compost mixed with mulch and water. As your potato shoots start to grow through, cover up with more compost and mulch mix and keep watered. Continue covering your shoots for 4 weeks and harvest when they reach your preferred size. Dig around carefully so as not to disturb the surrounding plants. Sow radish seeds 2cm deep and 3cm apart, into a pot of rich, organic soil. Thin out to 6cm apart when they are a week old. When thinning out crowded plants, you can use the whole infant shoot in salads. Radish plants like at least 6 hours of sunshine a day, and to be kept well-hydrated. For ultimate flavour, pick your radishes while they are still small and tender, just 4 – 8 weeks from sowing the seeds. Plant seeds every two weeks or so for a continuous harvest. For best results, you will need a pot with good drainage, at least 20cm deep and 40cm wide. Fill it with potting mix, organic fertiliser pellets and place it in full sun. Sow your seeds 1cm deep and 5cm apart. At about 5cm tall, remove or replant any clustered seedlings. 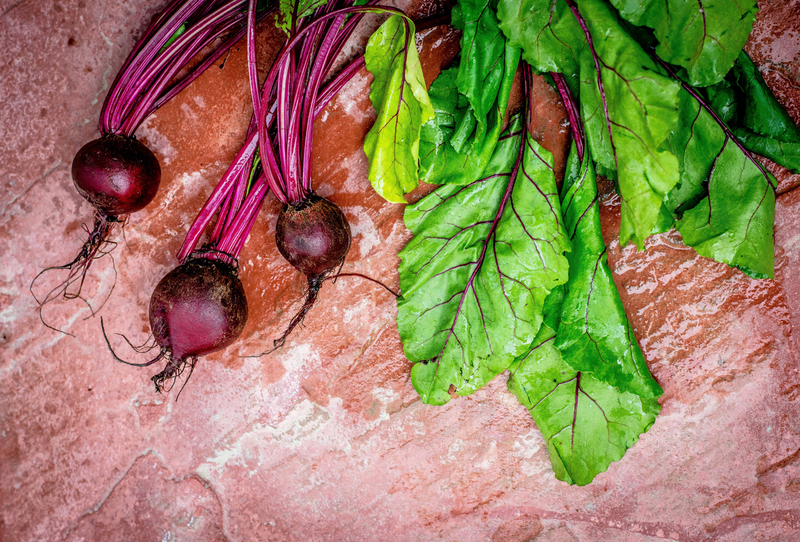 Beetroot leaves are great in salads or served wilted and can be harvested from 6 weeks. Leave the inner leaves intact so that your plant continues to grow. Harvest after 10 weeks when bulbs are 3 – 5cm wide. This article was originally published in Issue 5, Breathe Magazine – Start Believing.